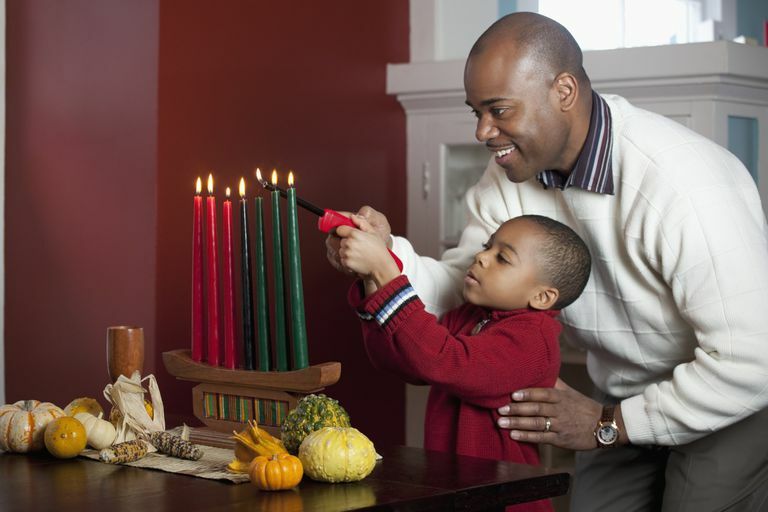 Lighting a Kinara is a Kwanzaa tradition your preschooler can help with (with plenty of supervision!). Inti St.Clair, Inc. Looking for a way to reflect on the old year while looking ahead to the new one? Kwanzaa is an African-American holiday that focuses on tradition, culture, and community. The name (sometimes spelled "Kwanza") comes from the language of Swahili and means "first fruits." Kwanzaa is a great holiday to observe with your preschooler. It's all about family togetherness and features lots of fun things that little kids (and families too!) love — food, dancing, crafts and family time. Each day, a candle (collectively called the Mishumaa Saba) is lit in recognition of these principles. The candles — one black, three red and three green — are held by the kinara, which is placed on a mkeka, or straw mat. One candle is lit every day. To honor the children in the family, one ear of corn (called the vibunzi or muhindi) is placed under the kinara for each child. Other symbols include a fruit basket (mazao) and a unity cup (kikombe) which are both placed on the mkeka. Kwanzaa begins each year on December 26. Many Christian African-American families celebrate Kwanzaa along with Christmas, placing the kinara near their Christmas tree. On Kuumba, usually held on December 31, there is a feast called Karamu which celebrates cultural expression. On this day, family members and friends play music and make crafts. These crafts are often exchanged on the last day of Kwanzaa (Imani), a day for honoring traditions and sharing. Because Kwanzaa is so family-oriented it's easy to get children involved. Plus, many of the activities surrounding this rich-with-history are either geared at children or certainly adaptable to little ones. The main colors of Kwanzaa are green, black and red. Incorporate these hues into your decorating and crafts, from collages to placemats. Since Kwanzaa has a big focus on creativity, encourage your little one to make handmade cards and signs to give to relatives and friends, using clip art of important aspects of the holiday. Our collection of coloring pages will also let kids get creative while learning about the important symbols of the holiday. Don't be afraid to let children get involved with the most important aspects of the celebration. Kids can help an adult light the kinara by holding the grown up's hand as they do it. Preschoolers can also help by placing the ear of corn under the kinara, as well as putting the fruit basket and unity cup on the mkeka. Young children learn best if they are learning while having fun. Try reading a book about Kwanzaa or listening to music for and about Kwanzaa that is geared at little ones. If you are going to be traveling during any part of the week, there are a host of events being held nation-wide that are family-friendly with a range of activities, from music to exhibitions and performances. Like most holidays, food is front and center during Kwanzaa. Typical flavors include a mix of both sweet and spicy with lots of fruits and meats. While some of the dishes may be new to your preschooler, there are definitely dishes that will appeal to them, including Chakhokhbili (Georgian Chicken with Herbs) and Curried Chicken and Banana Soup. No matter how you celebrate or how extensive your festivities are, when it comes to holidays, remember that family should be the focus. Kwanzaa is no exception, in fact, it's the rule. For more on Kwanzaa, visit The Official Kwanzaa website. Joyful Kwanzaa!